Today I am proud to be contributing to the fabulous Kids for Kindness series in which Lauren from Tutus & Tea Parties challenges families to do an act of kindness each week which is do-able and fun. Go here to check out this lovely series of posts – there are many creative and inspiring ideas about sharing kindness! 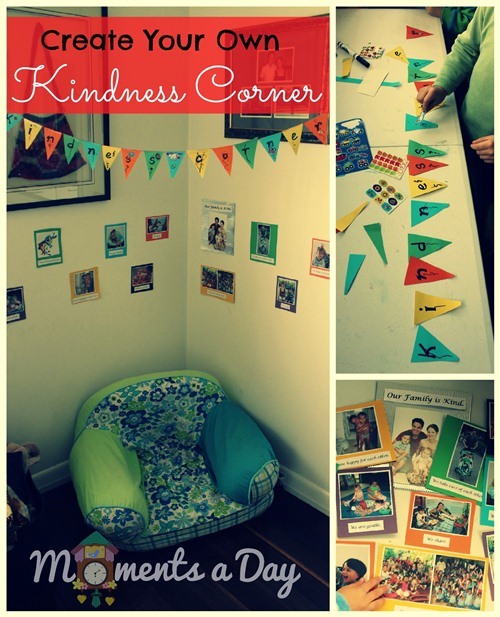 What is a Kindness Corner? For us, a Kindness Corner is basically a place where we compiled images to remind us of being kind (in the hopes of encouraging more kindness in the future). I came up with this idea to help my children see the many ways they have, and can, practice kindness each day. 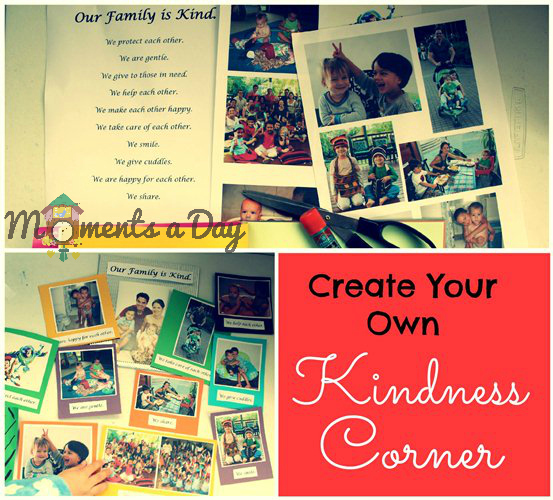 I found the activity of creating a Kindness Corner to be very empowering because it gave me specific examples to use (along with visual reminders) while explaining to my children about what it means to be kind… and the boys really enjoyed seeing themselves in the photos practicing kindness. “Kindness” can seem like an abstract idea to children, who are still learning the vast meaning of the quality, and this was a fun way to make “kindness” more hands-on and achievable. After making our Kindness Corner, we have enjoyed many conversations about kindness in it and have decided to do particular acts of kindness for others… such as making a favorite meal for someone, helping with a certain household task, doing a random act of kindness, or picking up trash in the neighborhood. I’m sure many more acts of kindness will be inspired by this special place. First, choose a spot for your Kindness Corner. There was a corner of our lounge that we keep a soft chair and beanbags, which we generally use for reading or fort-building. This was the perfect place for our Kindness Corner, but if you do not have an empty place don’t be discouraged. You can simply choose a corner of your child’s room for this activity, it really does not need to be somewhere totally empty. And you can make it as simple or elaborate as you wish – incorporating chairs, the ceiling (hanging pictures like this), or using only wall space. Second, find pictures that demonstrate kindness in action. You may like to do this step with your kids or without, depending on their ages and how long it will take you to weed through photos. I had a few in mind which I had posted online previously, and so we browsed a few albums of photos together looking for examples of kindness. It was fun to see what the boys picked out! I then copied the photos into a Word Document and printed them out at home on the regular printer, as we didn’t want to make a special trip to the photo shop. “We are gentle.” Playing with dolls. “We give to those in need.” A fundraiser our family organized for collecting toothbrushes for a preschool abroad. “We help each other.” Older son brushing younger son’s hair when he was a baby. “We make each other happy.” Boys making jokes/silly faces. “We take care of each other.” Daddy pushing the boys in a stroller. “We give cuddles.” Boys hugging each other. “We are happy for each other.” Picture of two boys hugging after a milestone moment (first poo in the potty). “We share.” Mommy feeding boys at a restaurant. You can download our captions in a Word document by clicking here. Feel free to adjust the wording and font as you wish! You can decorate however you wish, but we decided to make a hanging that said “Kindness Corner” as our feature decoration. I cut out triangles of colored paper and the boys helped put them into a pattern. 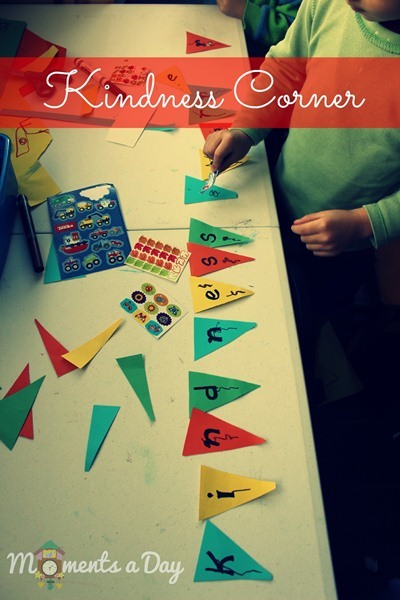 Then we wrote the letters for “Kindness Corner” on each triangle, and decorated with stickers and markers. Finally, I taped each triangle to a string and we used blue tac to connect it to our wall. Simple! It has been a few weeks since our Kindness Corner was completed and since then the boys have enjoyed many moments looking at the pictures and showing them to guests when they visit. When we read in the corner I refer to a few pictures and ask them to find certain acts of kindness as a game (like, “Can you show me the picture where you are being kind by smiling at others?”), ask them if they have done any acts of kindness lately, or share an example of how I have seen them display kindness lately. Just a few conversations here and there keep kindness at the forefront of our minds. It was a simple activity but this Kindness Corner keeps “kindness” in the forefront of our minds, and has given us many opportunities to discuss acts of kindness and remember kindness throughout our day. We probably wont keep our Kindness Corner up forever (as furniture often gets moved around in our house to make way for various projects and homemade forts) but when we take it down, I plan to put all the photos into a booklet (using the family photo as the cover) so we can keep them as a record and refer to them to remember ways we can show kindness. I think the booklet will be neat for the boys to look back on after a few years to see how, even when they were young, they could show kindness and make a positive difference in peoples’ lives. 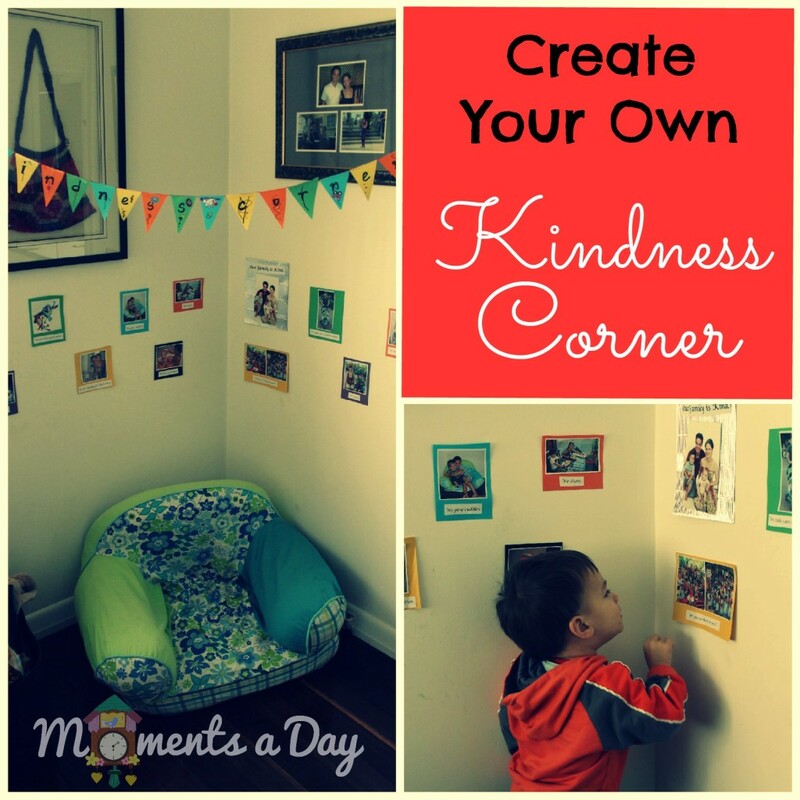 Would you like to make a Kindness Corner? Please let me know your plans and/or how it went! If you liked this idea, I would love you to share it! 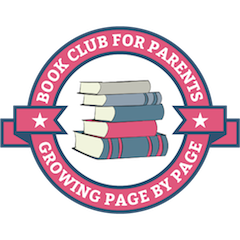 If you enjoyed this post, you may like to browse for more simple and fun activities that contribute to building character by clicking here. Thank you so much for sharing this with our Kids for Kindness series. I love this idea! I think we will be working on this tomorrow. Another wonderful idea Chelsea. Thank you once again! Looking forward to doing this with my own 2 boys. Thank you for sharing.